Blue Knights Ohio 18 Website Award Page. 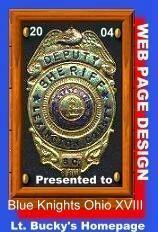 Our website's first award is the 2004 Lt. Bucky's Web Page Design Award. Lt. Bucky is from the Lexington Co., South Carolina Sheriff Office.